At the end of the original processing of Silico Manganese ore to remove as much metallic manganese as possible, one is left with what is referred to as a slag, comprising granules of silico manganese denuded ore. The slag is then further processed by crushing and washing to remove as much of the remaining metal as possible until further processing is no longer economically viable. The remaining ore is then screened and sold for use in cement manufacture as an ingredient, and concrete production as a cementitious, reactive aggregate. Sibenik in Croatia. Shipment is either in bulk or containerized. Sibenik can handle bulk carriers up to 30,000 tonnes. After the process described above the material that remains is made up of around 40% silica, 20% lime, 16% aluminium oxide and 10 – 14% manganese oxides. The iron oxide content generally comes in at around 2%. Over 70% of this material is glass and has no crystalline structure. As the slag is formed at a lower temperature than that found in the hottest part of the cement kiln one can assume that it will add to the liquid phase of the material moving through the rotary kiln. The normal liquid phase is made up of calcium oxide, iron oxide and aluminium oxide and the slag contains very little iron oxide. Manganese sits next to iron in the periodic table and shares many of its properties. In cement clinker a certain amount of iron oxide can be replaced with manganese oxide which means this material is suitable as a raw material, although there will be a limit as to how much manganese can be present in a cement clinker. Why use Silico Manganese Slag? Depending on the delivered cost of the raw materials to the point of production, silico manganese slag can offer a direct raw material saving. Silico manganese slag is precalcined. 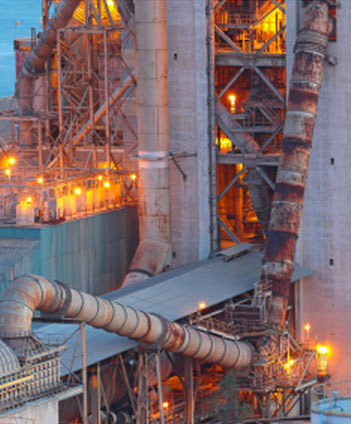 Approximately 65% of the fuel used in cement production is used in the calcination phase, so if a decent proportion of the feed is already calcined then there are savings to be made. - One source of C02 emissions in the production of cement is from the burning of fuel. If silico manganese slag is used less fuel is required to be burned resulting in reduced emissions and a saving in carbon taxes. - The other is the C02 removed from limestone. As part of the C02 producing limestone has been replaced with precalcined silico manganese less C02 is produced here as well offering a further reduction in Carbon emissions. This table gives an indication of potential CO2 savings calculated from laboratory work. The calcination figure is based on the fact that the calcium oxide in the si mang slag is not present as calcium carbonate and so will not release CO2. For a kiln producing 850,000 tonnes of clinker per year there will be an annual CO2 saving of around 13,500 tonnes. Fuel savings are less easy to pin down as they will vary depending on the type used, but they will be substantial. The following is a report on laboratory work originally carried out at IbuTec at Weimar in Germany. Some trials were carried out at a research organisation IbuTec in Germany to quantify the effectiveness of silico-manganese slag in reducing the heat required to make clinker. The Chart below summarises the results. 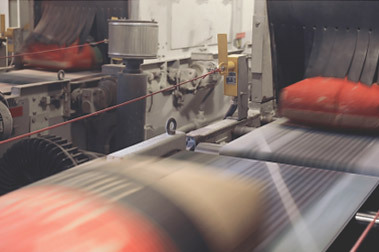 The basis of the test is that, as described above, the raw feed goes through first drying (which, in the laboratory is carried out in an oven before firing the mix) then calcining and then clinkering. Calcining removes the carbon dioxide from the limestone to produce lime, known at this stage as free lime because it is neither the calcium carbonate in which form it started off, nor calcium silicates or the other calcium compounds which are formed in the clinker. This free lime is the same as quick lime formed in a lime kiln. Clinkering then combines the free lime with the oher oxides to form the clinker minerals. In practice there is always a small amount of free lime left at the end of the process because the reactions do not have time to reach equilibrium. 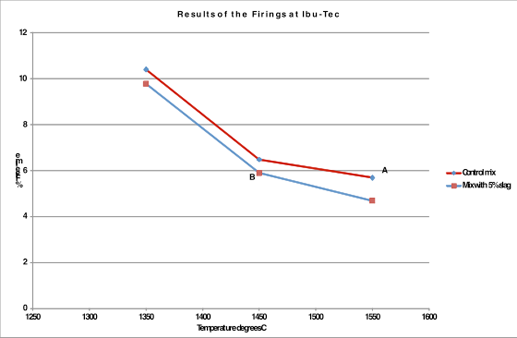 In this test two mixes of raw materials, a control with standard raw materials and one with 5% Si-Mn slag incorporated, were fired at successively higher temperatures and the quantity of free lime was measured to see how far the reactions had progressed. In the mixes containing slag the target quantity of iron oxide was reduced by the quantity of manganese oxide present. As described above, calcination generally occurs between about 800°C and 1000°C. The control raw mix (red line) shows no free lime at 800°C as would be expected. The mix containing 5% Si-Mn slag has 5% free lime. It is possible that the slag contained a small amount of free lime from its initial heat treatment but it certainly was not 100% free lime so the indication is that the presence of the slag has encouraged the calcination of the limestone to happen at a lower than usual temperature. By 900°C some 30% free lime is present in the slag mix compared to about 2.5% in the control mix, reinforcing the view that calcination has been accelerated. At 1000°C the two mixes have the same free lime. This indicates that all the limestone has been calcined and that the lime has been liberated from the slag because the overall lime content of the two mixes was the same. It also shows that the lime has not yet combined to form clinker minerals. It is worth noting at this point that about 65% of the fuel in a kiln is used at the calcination stage and that this reduction will have a beneficial effect on fuel use. At 1100°C the free lime is reduced indicating that some of the free lime has now combined to form other minerals and the blue line has moved below the red line. There may be some dicalcium silicate formation but also the lime will be combined with alumina and iron oxide to form the liquid phase. Again this has happened earlier with the slag mix than with the control. The 1200°C result shows a similar story. The mixes at 1350°C and higher simulate what happens in the hottest part of the cement kiln where the tricalcium silicate is formed. This will form over 50% of the final clinker and is the mineral which gives cement its strength properties. Again the blue line is below the red line indicating that the reactions with slag are happening at a lower temperature than in the control mix. The difference may look relatively small at this stage but if we look at points A and B on the chart, they both represent similar levels of free lime in the clinker. The temperature difference, however, read horizontally, is approximately 100°C, which is a significant amount. This is seen more clearly in the detail from the chart shown below. Iron oxide is frequently the most expensive raw material used in cement manufacture. In white cement clinker it is not used at all because it colours the clinker, in most grey cement clinker there is 1 to 2% iron oxide added. In sulphate resisting clinkers, including oilwell cement clinker, the quantity of iron oxide used is greater, about 3% would be common. It is as yet uncertain how much manganese oxide can be used to replace iron oxide because the research I have studied generally uses the slag in addition to iron oxide, which produces too much of the combination and can be detrimental. 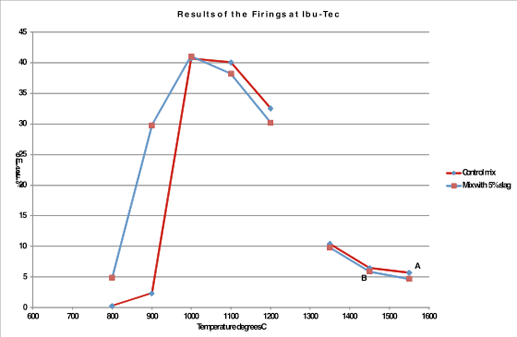 The work carried out at Ibu Tec laboratories indicates that replacement of iron oxide by manganese oxide has positive advantages. Portland cement clinker typically contains about 8% iron oxide. It is not certain how much of this could be replaced by manganese oxide, but as reported above 1.5% in addition to the iron oxide has been found to be acceptable even in addition to iron oxide. The table above is to give an indication of the potential savings in CO2 release from clinker manufacture. Tha calcination figure is based simply on the fact that the calcium oxide in the slag is not present as calcium carbonate and therefore will not release carbon dioxide. The laboratory work suggests that there will be considerable benefits in reduction of the temperature required to calcine limestone which I do not have the enough data to quantify at present. The other figures are from standard heat balance calculations and suggest a total annual saving of 13500 tonnes of CO2 from a kiln producing 850,000 tonnes of clinker per year.